Avoid food that makes you fat. 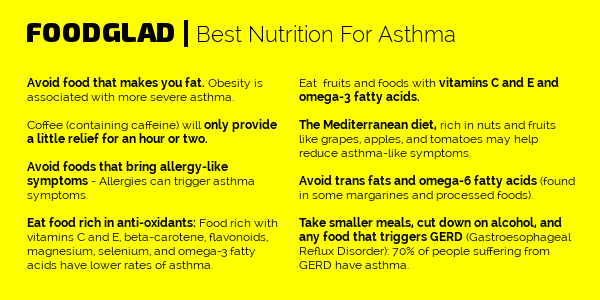 Obesity is associated with more severe asthma. Coffee (containing caffeine) will only provide a little relief for an hour or two. Avoid foods that bring allergy-like symptoms - Allergies can trigger asthma symptoms. Eat food rich in anti-oxidants: Research shows that people eating food rich with vitamins C and E, beta-carotene, flavonoids, magnesium, selenium, and omega-3 fatty acids have lower rates of asthma. Eat fruits and foods with vitamins C and E and omega-3 fatty acids. The Mediterranean diet, rich in nuts and fruits like grapes, apples, and tomatoes may help reduce asthma-like symptoms. Avoid trans fats and omega-6 fatty acids (found in some margarines and processed foods): Research shows these foods may worsen asthma. Take smaller meals, cut down on alcohol, and any food that triggers GERD (Gastroesophageal Reflux Disorder): 70% of people suffering from GERD have asthma.